A friend once asked me how to make Mod earrings. "Yes, those ones youre wearing!" my friend replied. That's how the name of these earrings was born. 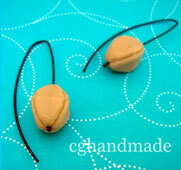 These charming and elegant earrings are easy and quick to make. The look of your earrings can be changed dramatically by using different metals, beads and patinas. Make sure you check out the variations at the end of this tutorial for some ideas. 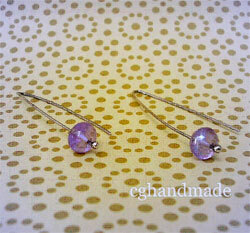 I'm using some handmade gold-filled headpins and glass beads. a rawhide hammer you can use a rubber mallet or a nylon hammer from the hardware store. 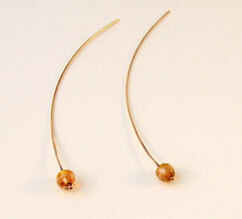 Step 1: Wrap your headpins around a round object to make them have a gentle curve. *Any object used in jewelry making as a rounded forming base is called a mandrel. In this project I'm using a wooden box I had lying around. 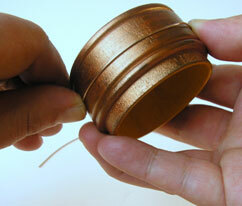 You can use a tomato paste can, small jar, or commercial bracelet mandrel from a jeweler's supply. Step 2: Check your curves and make sure they match. *If there are any kinks or bends in your headpins this is your last chance to straighten them out. If necessary, pull your headpins through the jaw of your nylon jaw pliers to straighten them. 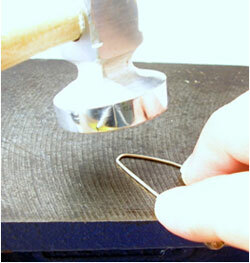 Step 4: Grasp your headpin with your round-nosed pliers. You want to make a large-ish rounded bend in the wire slightly off-centre on the headpin so that your earwire will hang longer in the back than the front. 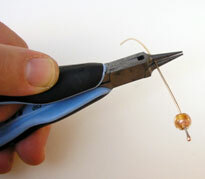 Step 5: Using your fingers, gently bend the wire around the largest part of your round-nosed pliers. 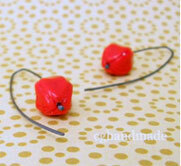 Step 6: Make your second earring. 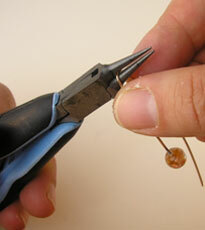 Tips: I make the second match the first by holding both in the pliers at the same time, matching the beads together. When I'm pretty sure I have the second wire grasped properly, I carefully remove the first from the pliers without disturbing my second headpin from its position. Then I bend the second and double check that it matches. If necessary, I adjust the bends with my fingers. Don't worry yet about making the back part of your earring match- we'll trim the ends later. Step 7: Harden the wire into its new shape. To do this, place your earring on an anvil or steel block, hold it firmly, and give it some good whacks with your rawhide hammer. This hardens the metal because it compresses the molecules in the metal. 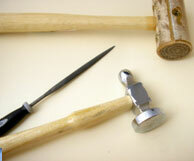 Using a rawhide hammer (or nylon hammer) will harden the metal without changing its shape or flattening it. 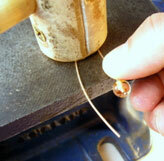 Tips: Hold the wire tight and hang the bead off the edge so you don't damage it. Don't whack your bead with the hammer. Step 8: Using a metal hammer, tap the bend lightly and repeatedly until you like the look of it. Using a metal hammer will flatten the wire where you strike it so be gentle. We're going for a slight flattening here. 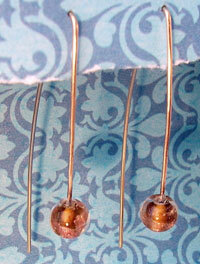 Step 9: Using your flush cutters, trim the back ends of your earrings so they match exactly. Step 10: Use your file to soften and round the ends of your earwires. Make sure the ends of the wire are nice and smooth so they don't cause micro-tears in the earring wearer's earlobe holes. 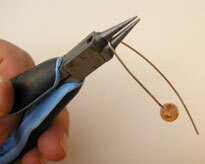 Step 11: Polish the fingerprints off your beads and wire. Done! 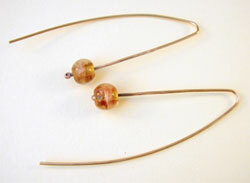 Jeweler's tools make this project easier, but you don't necessarily need jeweler's tools to make these earrings. 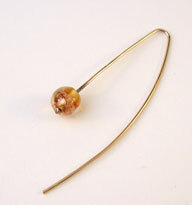 Use handmade balled sterling silver headpins and vintage czech pressed-glass pod beads. Oxidize the earrings with liver of sulphur to create a matte black patina. Honey jade is said to bring good luck to those who wear this gorgeous semi-precious gemstone. Use some oxidized "super simple headpins" and 6 faceted honey jade gemstone rondelle beads to create a pair of earrings that will make you look gorgeous and bring you luck at the same time.